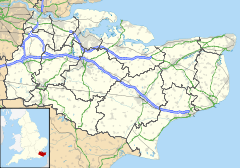 Lydden is a civil parish and small village in the Dover district of Kent, England. The Lydden Race Circuit is located between here and Wootton to the west of the village. Lydden village consists of a triangle of 3 roads: Canterbury Road (part of the old A2 running between Dover, Canterbury and London), Stonehall and Church Lane. There were two pubs in the village, The Lydden Bell (pictured on the right) and The Hope Inn. The former pub is thriving offering good quality food and a home to the village skittle and dart team. The Hope, however, has been shut since January 2011 partly knocked down and converted into a house, the grounds are being developed into new housing. There is also a school and a church in the village. Perhaps one of the most notable things about Lydden is the surrounding landscape. Lydden is set in a steep sided valley with grazing pasture and pockets of woodland along the valley side facing north west and an extensive National Nature Reserve (The Lydden Temple Ewell NNR) facing south west. The NNR is famous for its chalk grassland habitat and species including the adonis blue butterfly. As of 2012 there has been a new Doctor's surgery built in Lydden, having been built to replace the former Doctor's surgery in River which has now been closed. Lydden is part of the electoral ward called Lydden and Temple Ewell. The population of this ward at the 2011 census was 2,342. ^ "Parish population 2011". Retrieved 4 October 2015. ^ "Lydden and Temple Ewell ward population 2011". Retrieved 4 October 2015. Wikimedia Commons has media related to Lydden. This page was last edited on 23 February 2018, at 03:33 (UTC).